Clara Fronabarger led Republic with 13 points vs. Catholic. The Lady Tigers allowed 22 points in the first quarter, but only 12 points in the entire second half, as they pulled away from Springfield Catholic for a 58-43 win in the final game of the Nixa Invitational Saturday. Republic overcame 13 three-pointers by the Irish––nine of them in the first half. Catholic could do no wrong offensively in the opening quarter, dropping in six threes to take a 22-18 lead after the first eight minutes. Republic outscored Catholic 10-9 in the third quarter to close the margin to three, 31-28. After the break, though, Republic’s defense ratcheted up another level. The Lady Tigers allowed just nine points in the third quarter and took a 41-41 lead after three. In the fourth, Republic dominated, outscoring the Irish 17-3 to win going away. Clara Fronabarger (13 points) and Halli Bartelsmeyer (10) led Republic in scoring. Savana Powell-Goodman turned in her best varsity performance so far, scoring nine points, five of them in the first quarter to keep Republic close while Catholic was pouring in threes. 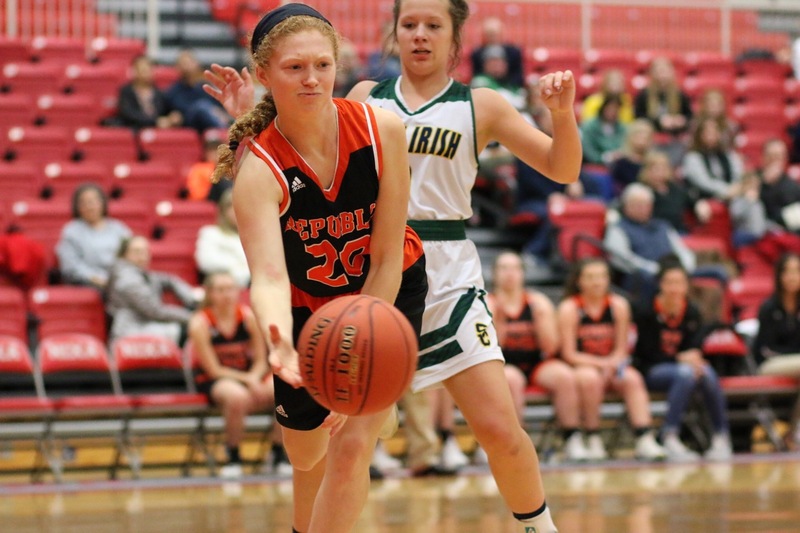 Republic rebounded from a difficult night Friday, when the Lady Tigers lost to Nixa 54-33. Republic’s outside shooters connected on just one three-pointer all night, and that didn’t come until the fourth quarter. Halli Bartelsmeyer led Republic in scoring with nine points in that game.